Organic latex mattresses are the ideal choice for people who want to enjoy the health benefits of “breathability” and full-body support while minimizing the synthetic materials and potentially harmful chemicals in their sleeping environment – where about one-third of our lives are spent! To qualify for the organic latex mattress category, the latex should be at least 97% natural and not a blend of natural and synthetic materials. Organic latex mattresses also utilize other “clean and green,” biodegradable components, such as an organic cotton cover and batting. Organic wool wrapping, which acts as a natural fire barrier, is added to most organic latex mattresses as a safety feature. 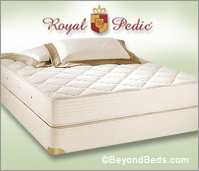 Look for third-party certification to confirm that any organic latex mattress you’re considering is the real deal.